We don't get all that political here at HBG, but this one really gets under my skin, and I had to post this tonight in hopes that we might be able to make a difference before Thursday's vote. This Thursday, the Senate Appropriations Committee will be considering an amendment to HB 1604 which increases the excise tax on Alcohol by 100% to help fund the Marion County Capital Improvement Board shortfall caused by the Pacers, Colts and Convention Center operating losses. In an effort to gain support for the idea, the anticipated $42 million increase in alcohol taxes would be distributed statewide to cities and towns throughout Indiana on a population basis for economic development initiatives. Only Indianapolis ' portion ($8 million annually) of this increase would go to the Marion County Capital Improvement Board. Call the numbers above and ask for the Senator or the Representative below and let them know raising alcohol taxes is not the way to pay for the losses that the Indianapolis sports teams have accrued. Already, 46% of the cost of beer today is taxes, and in no way would it be fair to increase that amount. Increases alcoholic beverage excise taxes. Increases the beer and cider excise tax from $0.115 to $0.65 per gallon. Increases the wine excise tax from $0.47 to $2.07 per gallon. Increases the liquor excise tax from $2.68 to $6.95 per gallon. Provides that each of the funds that receives these excise taxes will receive the same percentage of the new rates as the percentage it receives under the existing rates. You can also email by going to this address: http://axetaxesnotjobs.com/ That page is sponsored by Diageo, but it does make it very easy to find and contact your Senator, state rep, and the Governor. What are you thoughts about this legislation? 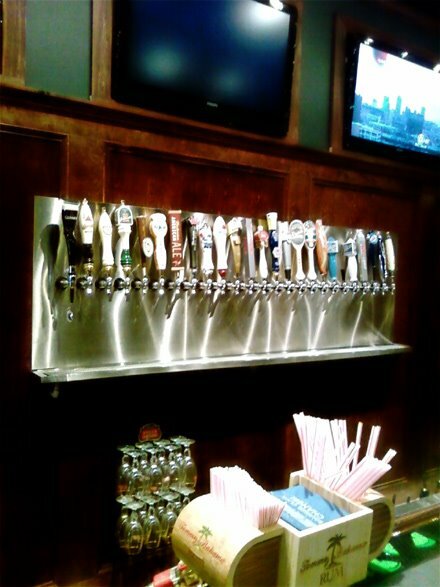 Fifty taps. Why haven't we heard about this place? A quick click on the link and I quickly discovered why. You see, even though with this group I fall somewhere in the middle age-wise, everyone agrees that at Hoosier Beer Geek, I represent the AARP readership. I don't really do much bar hopping. And I don't visit South Meridian Street very often. When I did, I would usually go to Claddagh or the Slippery Noodle (I told you that I'm an old fart). 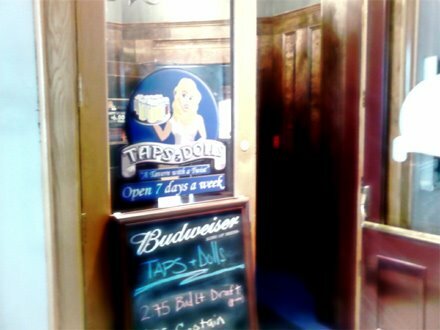 So it isn't a surprise that I hadn't heard of Taps and Dolls, a bar that fills in part of the void left by the former Hollywood Bar and Filmworks. But fifty taps...that sounds intriguing, even to a senior citizen. So on Friday, I headed to Taps and Dolls. On my lunch break. I'm hip. Replacement hip. They open at noon, but this second floor bar was empty. But my co-worker and I hopped onto a bar stool and looked over the beer menu. What do they have on those 50 taps? So is it a great use of 50 taps? Not in my opinion. Far too many BudMillerCoors products. But I don't suspect that this tap list is aimed at me. I'm betting that it is one of the best along the South Meridian Street strip. The ambience here isn't bad either. Not overly sports bar, not overly dance club. If anything, it is just a regular bar. So if I were forced to go drinking on South Meridian Street, would I go in here? Yeah, probably. There are a dozen beers that I would happily consume. 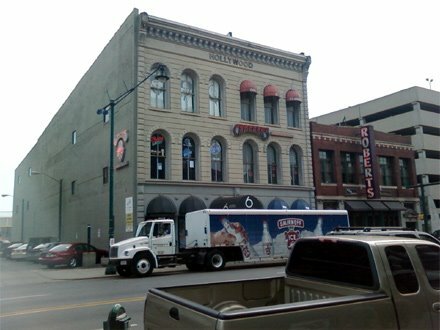 And with it being on the second floor, I bet it doesn't get as crowded as other bars. Because young people bug me. Though I'd rather walk the couple of blocks and go to Rock Bottom, Buffalo Wild Wings, or Scotty's. It will be interesting to see what happens to this beer list after a year. 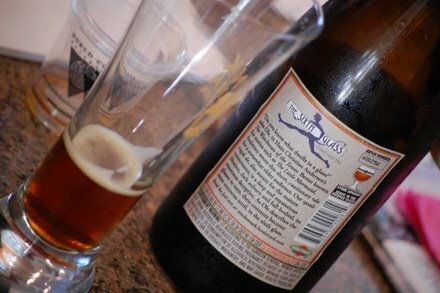 Will the microbrews make way for more macrobrew varieties? 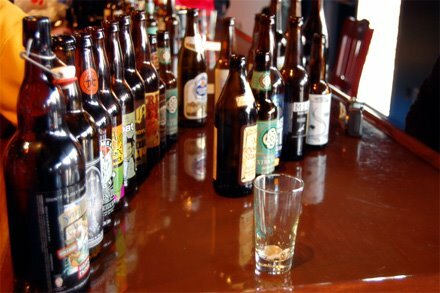 Will there be a demand for more microbrews? I suspect that the former is more likely, not the latter. But I hope I'm wrong. I think it goes without saying: I like beer. But more than that, I love the social aspects that come along with drinking beer, whether it be at a person’s home or at a bar. I like meeting people. And I’ve met quite a few. Sometimes, when I want to seem more important than I really am, I name drop. Not cool, but depending on the name, sometimes it impresses people. Mentioning Nick Floyd, for example, grabs the attention of any beer geek. Sometimes name dropping does you no favors. Mentioning Ted Miller, for example, will get you kicked out of bars and finer establishments. In today’s Random Beer Roundup, I have the opportunity to drop the names of some big people in the craft beer business. I have never met either of them, but am looking forward to meeting them in the near future. Let’s start with Greg Hall. He is the head brewmaster at a little Chicago brewery called Goose Island. He will be at Kahn’s Fine Wines on Wednesday, April 8th. He will be talking about (what else?) beer. There will be sampling of Goose Island’s regular, reserve, and special brews. There will be cheese pairings for some of those beers. 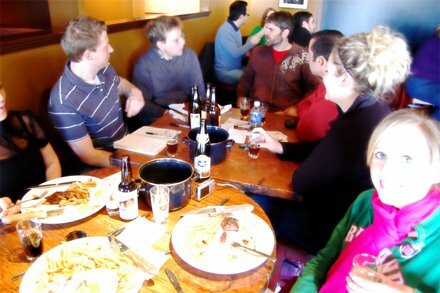 And for the low, low price of $15, you get to join Greg and many others (including some of the Knights of the Beer Roundtable) in the beer drinking, cheese-eating fun. Plus, you get to receive some Goose Island goodies. The event will be 6pm to 8pm. You can get tickets by emailing Cari Crowe at beerqueen@kahnsfinewines.com, calling Kahn’s at (317) 251-9463, or come by the store, which is located at 5341 North Keystone. Another name that I’m going to drop is Larry Bell. He is the founder of a little brewery in Michigan called Bell’s Brewing Company. He will reportedly be at the Beer Sellar on June 22nd. You might ask: Does Larry hang out in Castleton often? No, not normally. But on that Monday he will be, because the Beer Sellar will tapping 30 different Bell’s Beers at once. Thirty. Three-zero. That’s not only impressive, but it is world record breaking. 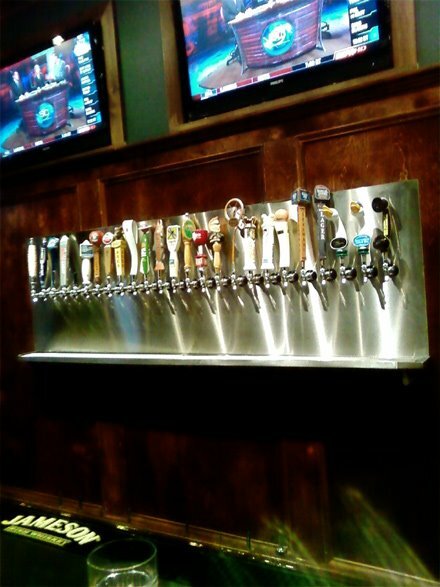 A bar in Ohio is the current record holder at 28 different Bell’s taps. Take that Buckeye Beer Geek! It is a bit into the future, but I suspect that it will be a big event. And who wouldn’t want the chance to drink a beer (or 30) with a man who turned a homebrew shop in Kalamazoo into a 90,000+ barrel brewery? I could drop other names, like Brooklyn Brewery's Garrett Oliver, Dogfish Head's Sam Calagione, or even Sam Adam's Jim Koch. But I never met them, and only reason to mention them is to grab people's attention. Like people doing Google searches. That's just a lame and dirty trick. We wouldn't stoop THAT low at Hoosier Beer Geek. Enough name dropping (Schmaltz Brewing's Jeremy Cowan). Here is your weekly Random Beer Roundup. Remember, if you have beer news that you want to share or names you want to drop, drop us a line at hoosierbeergeek@gmail.com. Louisville Brewfest. More details at The Potable Curmudgeon. FREE beer tasting every Thursday 6-8pm at the "Big Store" at 418 North College in Bloomington. 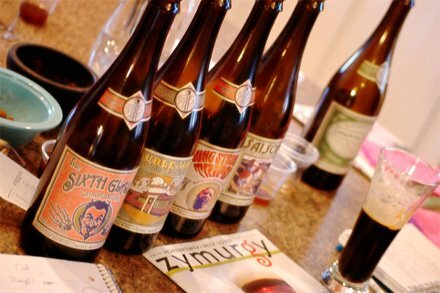 Beer tasting with Ryan Pierce from Cavalier Distributing, free. Meet Greg Hall, Head Brewmaster from Goose Island, $15. Taste all of the Goose Island beers, including the Reserve lines and some special brews, paired gourmet cheeses, and receive some Goose Island swag. For tickets: email Cari Crowe at beerqueen@kahnsfinewines.com, call the store at (317) 251-9463, or come by the store. Kahnoisseurs Klub members get 20% off the ticket price. Tapping Helios Pale Ale in honor of Upland's new solar initatives (see news below), plus educational tours and presentations on solar energy. Spring All-Grain Class, $25 per person or bring a friend and pay only $20 each. Details and registration on website. 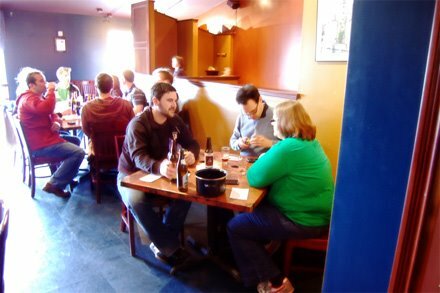 Beginning Brewing Class, $15 per person or bring a friend and pay only $10 each. Details and registration on website. Entries for the UpCup Competition are due. Big Bell's Brewing tapping, a record breaking 30 different Bell's beers on tap at once. The Upland Brewing Company, with support from Indiana’s Office of Energy & Defense Development, announces the installation of a solar water heating system in efforts to add to sustainable business operations in Bloomington, Indiana. Ten Apricus Tube Solar Collectors are to be installed, which will generate water heating at the rate of 3.5 kWh/m2/day, the heated water being stored in eight 120 gallon vessels to be used on demand. 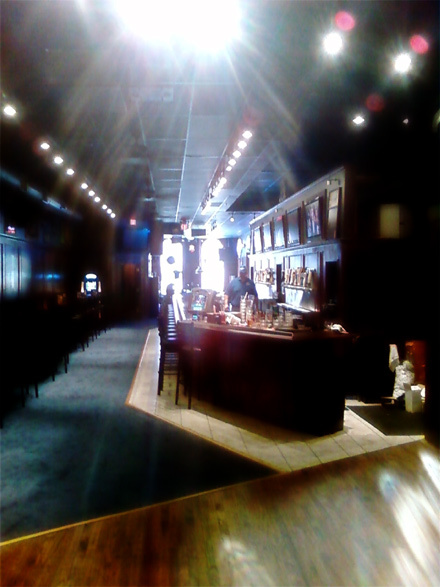 Review of New Albanian Brewing Company's new Bank Street Brewhouse in the LEO. He doesn't talk a lot about the beer (doesn't he know that lawyers work better drunk? ), but HBG-reader Doug Masson reviewed Lafayette Brewing Company's food for Lafayette Eats. From ProBrewer.com: A Scottish brewery claims to have produced the first authentic India pale ale in almost 200 years by ageing the beer aboard a trawler in the North Sea. I do not have any answers as to how to pay for the Colts and the Pacers but I know that this is a bad idea. This web link makes it very easy to voice your opposition. More about this developing story at the Indianapolis Star. We will be offering Full and half Slabs of Ribs, 16 Hour slow smoked Pulled Pork, Smoked Sausage Plate, Combination Dinners and all the fixin's to go along with each dinner. The Auburn location currently has 8 Mad Anthony beers on tap including our spring seasonal No.3 Irish Red, Oatmeal Stout, & I.P.A. American Wheat spiced with orange peel, coriander and chamomile. Big, rich and roasty strong ale. Rich and full mouthfeelwith wonderful fruit and spice character. Malty sweet garnet colored ale with a spicy, dry finish. very malty sweet garnet coloured strong ale. Oh, and...Founders Kentucky Breakfast Stout btls. while they last!!! You know it's Spring when Oberon starts hitting the shelves. Kahn's is taking pre-sale pre-orders of Oberon through Saturday, March 28. Cases are $29.99 (That's $7.50 a sixer!) and the pre-sale is for cases only. You do have to pay at the time of ordering, but there is no limit. Oberon will arrive Monday morning, and will run for $8.99/pack or $32.99/case all next week. Regular price will be $9.99/pack and $37.99/case. Give me a call at (317) 251-9463 or email me at beerqueen@kahnsfinewines.com if you'd like to reserve your cases. 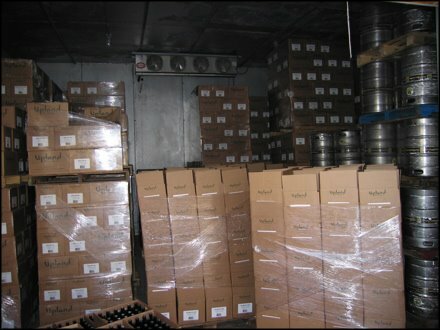 Yes folks, I held onto a few cases of Upland Lambics to age them and get them ready for the springtime. They'll be tasting great! I have in stock Blueberry, Cherry, Raspberry, and Strawberry. Sorry, no Peach, Kiwi, or Blackberry. $14.99/750 mL bottle. Samuel Smith Winter Welcome $2.99/18.7 oz. Hello from Crown Liquors!! A few new, great brews have made it into our chain and like always....more to come! These are a few of our recent additions. Bells Oberon will be here Monday!!!! The Founders KBS is here and all but gone! It is really wonderful amazing stuff. There is still plenty of Double Trouble available. The Cerise (new Cherry fermented Ale) is scheduled to land in our warehouse on April 1 (no fooling) Due to the high cost of raspberries Rubaeus is no longer being brewed and Cerise will takes its place as the Founders Summer Seasonal. Also the cherries are grown locally in Michigan. Some unknown distributor in an unknown state did not want all of their allocated Stone Old Guardian Barleywine. Can you believe that? Their loss is our gain as we received and extra 60 cases of this outstanding Stone Brew arrived in our warehouse this week! There is now more Old Guardian than ever available in Indiana! This beer ages wonderfully so now is the time to acquire some extra bottles and put them away in your celler! We now have Hades back in stock! If you have not had a chance to try this Belgian-Style golden ale now is your chance. Hades is brewed with a rare Belgian yeast strain that gives a complex spicy flavor and aroma. Noticeable hops and medium malt character make it a very well balanced, crisp ale. This beer can be enjoyed with Fresh mussels, crusty bread, artisan cheese. The Claymore Scotch Ale is going fast we are down to our last few cases in the warehouse. This beer is named for a medieval Scottish sword, Claymore Scotch Ale is our tribute to the legendary “Wee Heavy” beers of Scotland. This malty, deep-ruby beauty features lots of caramel sweetness, a reserved hop profile, and a subtle warming character. Unlike its namesake, this beer only requires one hand, but it’ll still make you feel like nobility. If we've learned anything in the past few months, it's that we know how to give away a shirt. And because the best way to retain knowledge is to continue to use it, we're giving away another shirt in hopes of not ever forgetting the joy that is shirt giving. Our latest giveaway is sponsored by the fine folks at Yesterbeer, who make a number of retro beer-branded shirts. And there's a special bonus this time - you can even pick the shirt size. "What do you remember about the beer that your Dad drank?" Contest ends 4/5/09 at 5PM. Multiple answers will be tossed (we'll only count your first). We reserve the right to not give you a shirt if we think you're shady. We reserve the right to change all the rules. If you've been to a beer event in Indianapolis, chances are you've seen Tamre Schemine. Despite her diminutive size, her enthusiasm for craft beer is gargantuan. Tamre recently moved to the Chicago area, but she still stops in from time to time to enjoy beer with her old Indy friends. Today we present the first in what we hope will be an ongoing series of articles in the use of beer in cooking. 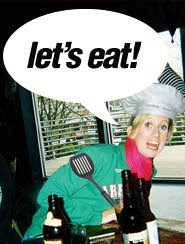 Ladies and Gentlemen, I present Tamre Schemine, our Soused Chef. There's nothing I love more than a fish fry during Lent - a parish hall full of screaming kids running around, cheap beer, and hanging out with my family. It's loud, crowded and awesome. This past Friday we decided to cook fish at home, so I found a recipe for a beer batter. 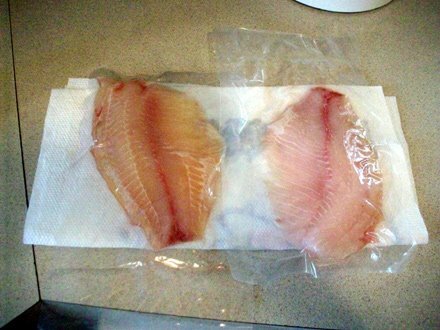 We used individually wrapped frozen Tilapia, but any whitefish would do. The fun part was trying to find a beer to use. Searching through what we had available I realized that I would get into trouble using Founder's KBS, Bell's Hopslam, Port Brewing Co. Hop 15, or Goose Island's Bourbon County Stout. Oddly enough, we had a few cans of Coors Light in our fridge. 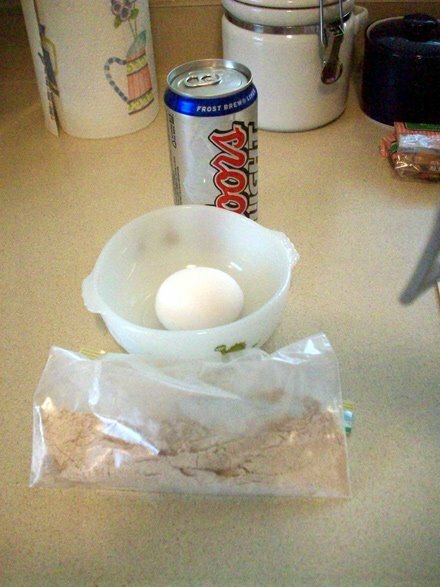 Coors Light is perfect for beer batter. It's light and the carbonation provides the flakiness needed for the batter. 1. Heat oil in a deep fryer to 365 degrees F (185 degrees C). Rinse fish, pat dry, and season with salt and pepper. 2. Combine flour, garlic powder, paprika, 2 teaspoons salt, and 2 teaspoons pepper. Stir egg into dry ingredients. 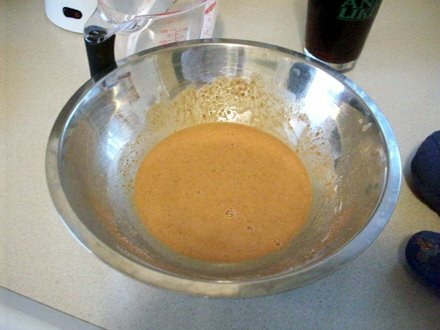 Gradually mix in beer until a thin batter is formed. You should be able to see the fish through the batter after it has been dipped. 3. Dip fish fillets into the batter, then drop one at a time into hot oil. 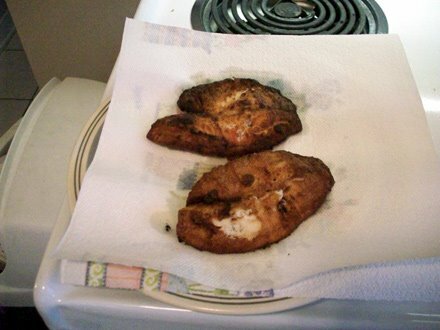 Fry fish, turning once, until both sides are golden brown. Drain on paper towels, and serve warm. Notes: If you have a deep fryer, definitely use it. We filled our kitchen with smoke from the pan of oil. The fish cooks pretty fast, so make sure as soon as it turns golden brown, flip it and the fish will cook maybe a minute on the second side before it's ready to come out. 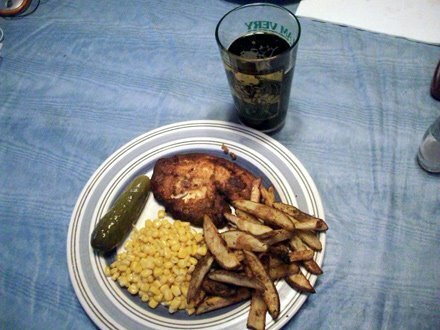 I made cajun oven fries to go with our fish and no fish fry is complete without deli pickles (at least in my house.) My significant other can't cook a meal without some sort of canned vegetable. Don't mind the corn. 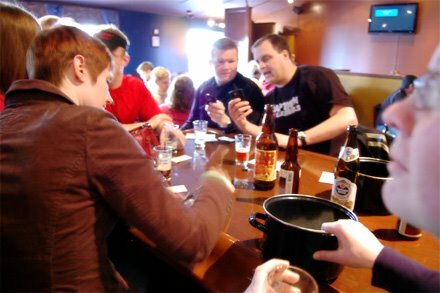 The American Homebrewers Association holds membership rallies a few times each year to encourage people to get their friends involved in homebrewing. These rallies are a great way to find out who else in your area is brewing and get some free drinks in the process. Homebrewers consist of all ages, sexes and races. Pretty much anyone you know could be a closet homebrewer (we have 2 on our block alone). 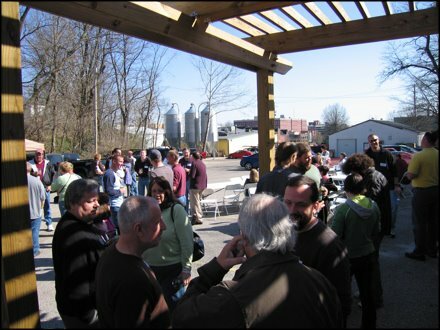 Upland was generous enough to host this Spring's membership rally and brought out a few special beers and basically gave us brewery tours and let us hang out and eat and drink for free all afternoon. The AHA had a great turnout and everyone appeared to have an awesome time. 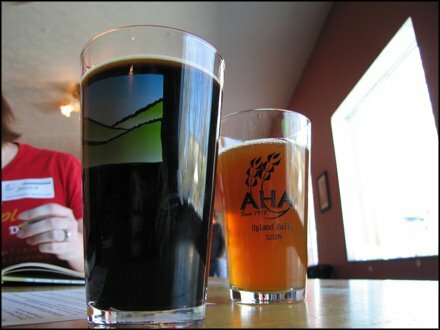 We were able to try out 2 atypical beers on tap. A version of Upland's Chocolate Stout aged in 23 year old Pappy Van Winkle barrels and their Dragonfly IPA dry-hopped with Summit Hops and served out of a firkin. The cask Dragonfly IPA poured little to no head, copper in color and quite cloudy. Caleb did mention that it was brewed in the past week and that it needed a few more days before it was officially done. The nose was pungent with soapy florals and hints of spicy hops. There's also a little bit of freshly cut grass in the nose that comes across as it warms. The mouthfeel was syrupy and not too hoppy. Overall it was very smooth and more of a hop nose than a hop flavor. I was more impressed with the Pappy Van Winkle Bourbon Barrel Aged Chocolate Stout (that name is long enough that I think I need to drink one to get through it) which had a toffee colored head and a motor oil appearance. I was disappointed that it didn't quite coat the glass - but it wasn't an imperial stout so all is forgiven. The nose had hints of bourbon, blue cheese and vanilla. The flavor was very smooth and not overpoweringly bourbon-y. The taste was complex and had layers of chocolate, vanilla bean and some sort of dark, dried fruit that I can only assume was figs. The bourbon aged Chocolate Stout gave off a delicious aroma of warm bourbon, complete with vanilla, light brown sugar, cherry and oak scents. This was blended in with caramelized banana and apple notes. The flavor of this matched the aroma well, but lacked any of the alcohol burn you would expect to find traces of in a barrel aged stout. Vanilla, figs and a sweet, smooth bourbon flavor came off strong, leaving hints of creme brulee and molasses behind. I'm not sure the ABV on this but it was highly drinkable no matter how strong it was. The cask-conditioned Dragonfly IPA was very smooth and perhaps a bit thick. Summit hops created a prominent grassy aroma that was accented by notes of pine and hemp. The mouthfeel on this one was very soft and carried a hint of malt sweetness. Dried orange, orange zest and caramel mingled with a restrained level of bitterness. While this was interesting, I can't help but think a few more days in the cask would have helped it out. 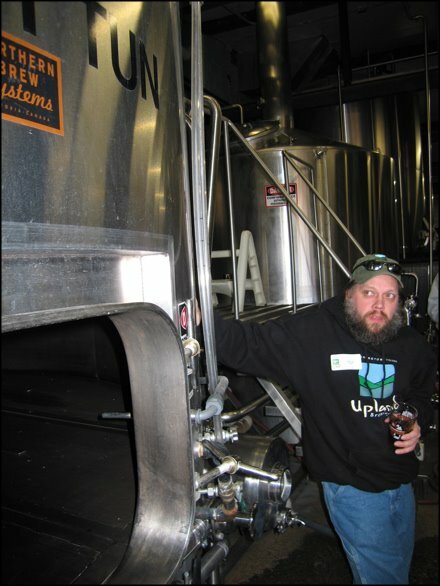 After enjoying a few rounds, we embarked on a tour of the Upland brewery. 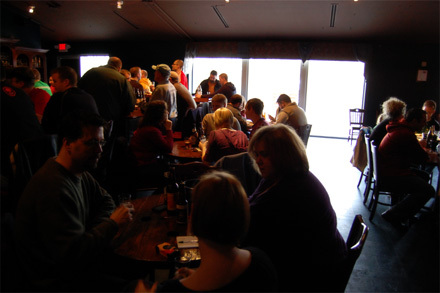 They work with a good deal of space, thanks to an enlarged warehouse attached to the back of the brewpub. 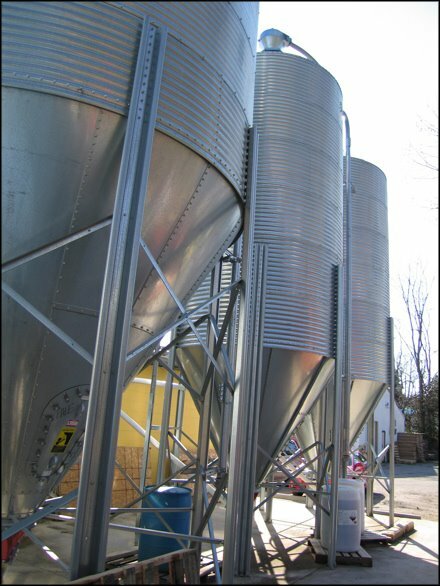 3 grain silos dominate the rear of the building, while additional speciality grains are stored inside. 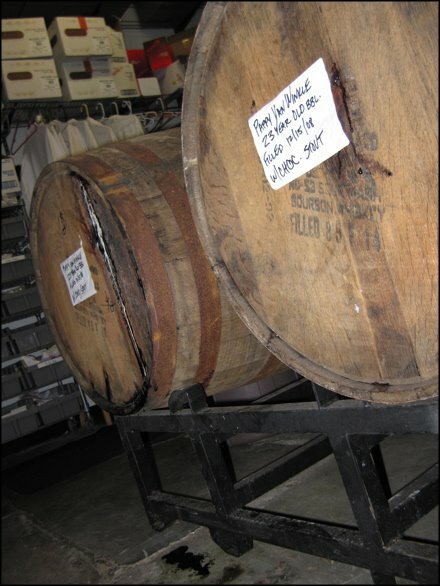 Making the most of their space, lambic and bourbon barrels litter the inside of the brewery, awaiting their time. It was noted that their bottling line is currently running at full capacity and this week they're bringing in a new, higher capacity unit. It should also be noted that each of their sampler 12-packs are hand assembled from the contents of other cases, making for a very labor intense process. And now, on with the pictures! After one day, how are your brackets holding up? Are you still in the hunt? Will you win that office pool? If you do, will you be buying the next round? To be honest, I'm only mildly interested in the NCAA tournament. Despite being a life-long Hoosier, basketball is not my favorite sport. It isn't even in my top five favorite sports (in order: football, baseball, hockey, curling, soccer). For the first time in years, I didn't fill out a bracket (of course, neither did Jess, but not for the same reason!). I may not be suffering from March Madness, but I am experiencing Spring Fever. And today is the first day of Spring! So if you can't use basketball watching as your excuse to enjoy a good craft beer, then raise a toast for the beginning of a new season! Here is your weekly Random Beer Roundup. Remember, if you have beer news or basketball views that you want to share, drop us a line at hoosierbeergeek@gmail.com. American Homebrewers Association (AHA) Rally. Kentucky Breakfast Stout "Kill the Keg" Night. Tickets go on sale at 3pm, $5 for a 5 oz. glass, one per customer. Keg tapped at 8 p.m. Five Founder's beers will be on tap that night. Dark Lord Day tickets are sold out. Jennette from the Indy Star pointed us towards to a two part story about coming-soon brewery Sun King. There is also a video where owner Clay Robinson receives his 15-barrel brewing system. Check it out here and here. New Albanian Brewing Company’s Roger A. Baylor writes a column for the Louisville Eccentric Observer. 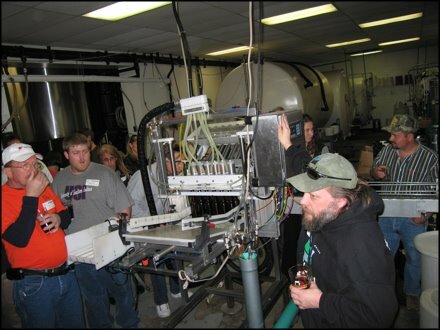 Bloomington's Hearld-Times newspaper has a new beer website, including a blog by Rod Spaw. Mad Anthony Brewing Co. has secured two taps in the Parkview Field Stadium. Look for us down the first base line and enjoy a Mad Brew while attending a Tin Caps Game. Join us before and after the game as well. We currently have Brugge White on tap as well as Two Bros. Northwind Imperial Stout, pushed with a Nitro blend, so it's creamy on top. Gaffel Kolsch is fairly constant for us, and now.........the news..........BLOOMINGTON BREWING COMPANY BEER IS RETURNING TO PATRICK'S !!!!! Floyd Rosenbaum has been sold out of beers each time we tried to get new kegs, so this Wednesday the 25th, I will be road-tripping with a keg of Ruby Bloom, their Amber, a keg of Nitro Stout (not to be missed), and Floyd is letting us have one keg only of "Brewer's Pale", which as I understand it is the fabulous IPA that Floyd brews once a year. That is one keg and one keg only kids....we will have a limit of two pints per patron in order to keep it for a while. Floyd made a movie and put it on YouTube....it is eartheatsfloydrosenbaum. Very cool and really ought to be sent out in a link or something.....thanks for the help and I hope we get you in for a beer on us. At Deanos we have Two Hearted, Smithwicks, Murphy Irish Stout. Lakefront Cherry Lager is freshly brewed and right off the truck this week. This wonderfully balanced fruit beer makes an appearance every year around this time. Made with fresh Door County Cherries, this beer is crisp and complex with a nice fruity, tart finish. Enjoy!! The info below was taken from the Distinguished Brands news letter: People are really missing out it they do not give O'Hara's a try. We have plenty of cases and kegs of the everyday Stout available. We are down to the very last few cases of the Celebration Stout,so get them while you can. While they are at it they should try the Curim Wheat and O'Hara's Red as well. IRELAND – On March 17th, The Irish Times printed a “Value for Money Stout” article that reviewed and ranked 5 Irish Stouts. Out of the five stouts ranked - which included Beamish, Guinness, Murphy’s, and Mark’s and Spencer - O’Hara’s Leann Folláin, Carlow Brewing Company’s newest product, was the only one that received 5 out of 5 stars. This new stout is similar to their Celebration Stout and currently is only available in Ireland. Another interesting note to point out is that Mark’s and Spencer Irish Stout, which received 3 stars, is also brewed by Carlow Brewing. and remember March 30th is Oberon release!!! Great Fermentations would like to extend a warm welcome to brewers to join us for Big Brew. Darren will be firing up our system to brew 20 gallons of the Mild that day. Bring your brew pots and burners and brew either of the Big Brew Recipes. And of course, bring beer to toast National Homebrew Day at 1 PM. 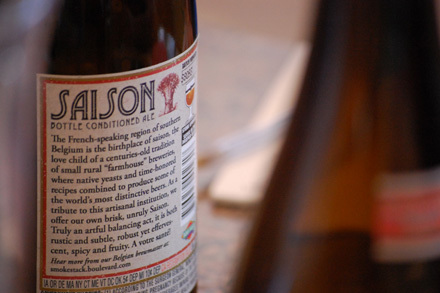 Saison Du Mont is a Belgian-style Saison developed by a truly special home brewer, Dave Levonian. Dave was a long time member of QUAFF, a homebrew club in San Diego. Unfortunately, Dave lost a short battle with cancer in February of last year at the age of 39. Though Dave had a short life, he has left an indelible mark on the home brewing community in southern California. Dave was well known for his flavorful Saison Ales. 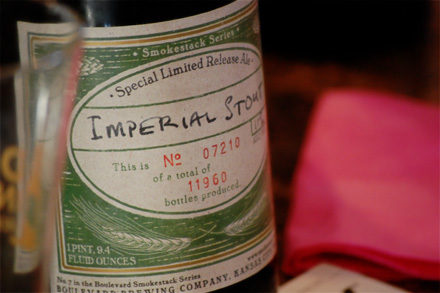 We are fortunate to have this recipe directly from his brewing records. Dave always emphasized two points about Saisons: be sure to use enough Vienna Malt so the beer has a nice orange hue and make sure that all spices are added conservatively, as they should not be identifiable in the flavor profile. One should know it is a spiced beer, but never be able to actually identify a specific spice. Please brew this beer and enjoy it with friends and family, because that is what Dave would have done. Enjoy! 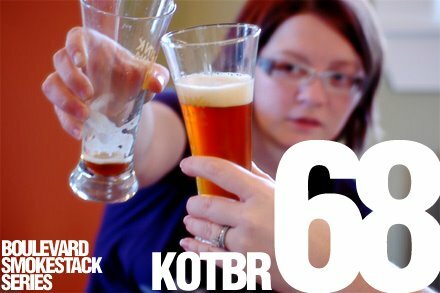 The second Big Brew recipe for 2009 started out as a homebrew recipe, then it was scaled up and brewed at a craft brewery and won the brewery’s first medal at the Great American Beer Festival (GABF), and now it’s a homebrew recipe again! Most of the Dry Dock Brewing Co. recipes (including this one) began as homebrew recipes. Because of the strong home brewing roots of the brewery, Dry Dock publishes all of their recipes in 5 gallon proportions so home brewers can try to make them if they want. 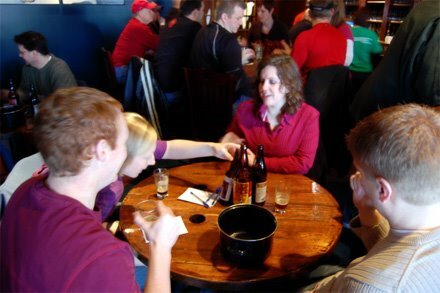 The Upland Brewing Company UpCup Competition is being hosted once again in the aims of replicating the best of the best of Midwestern homebrews. 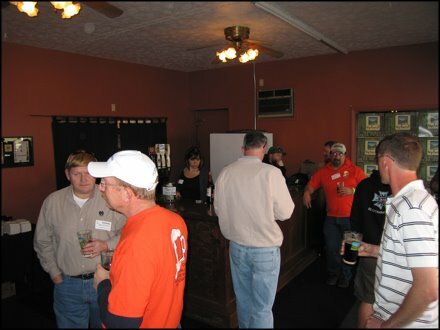 The 2008 UpCup was a huge success, last years UpCup Champ Kenneth Smith's Bad Penny Imperial IPA will be tapped during the awards ceremony. BJCP entry form, found at http://www.bjcp.org/SCP_EntryRecipe.pdf. - $5 check made out to Upland Brewing Co. for the entry fee. Entry fees will be redistributed to all attending BJCP certified judges who will be evaluating for the day, and transportation and lodging for the winning homebrewer. Any questions can be directed to Caleb Staton, Competition Organizer at caleb@uplandbeer.com. Awards will be given based on number of entries, with the Best of Show receiving the UpCup. I'm not a Son of Erin by blood. But, I am one by marriage, so I enjoy getting into the spirit of St. Patrick's Day. That, of course, includes the beer. We all know the St. Patrick's Day staples: Guinness, Harp, and some form of Irish Red (Killian's, Murphy's, etc.). And then there is that vile creation of American macro-brewers: green-tinted lager. So the KOTBR want to know this--What beer are you drinking today? Are you going with any one or a combination of the above (we hope the answer is "no" on the green beer)? And if you are having a beer or beers, when and where are you drinking? Drop us a comment to let us know. My choice: Three Floyds Black Sun Stout, this evening, at home. So Erin Go Bragh and all that stuff. What a great weekend of beer. I started Friday off with my first full samples of this beer and then we had a wonderful morning of delicious food and beer at the Brugge on Saturday for our beer geek breakfast. I tried a very small sample of this beer at the winter micro brewers festival, but my palate was pretty much shot by the time I tried it, and my local purveyor got several cases of this in, and at $8.99 for a sixer it is a pretty good price for a six pack of an IPA. Appearance: Pours a nice clear amber color with two fingers worth of head on it. Smell: It isn't the most intense IPA, but I do get lemon peel, grapefruit rind, and some other citrus smells lightly balanced with a touch of toasted malt. Taste: The flavor profile is very well balanced between the citrus flavors and a nice toasted malt base. I am also getting a slight touch of caramel in the malt that is welcomed on this offering. I was hoping for more bitterness and pine on the flavor profile, but they are only slightly apparent. Mouthfeel: Good carbonation leaves an almost prickly sensation in your mouth and it coats the mouth very well. Drinkability: Great balance on this beer helps makes it quite easy to drink. I could easily see myself taking a sixer of these to BBQ's this summer. This a hopped up version of their standard pale ale. It is classified as an IPA, but the IBU's are not over the top, and the malt backbone in many respects outshines the hop flavors on this beer. If you are a big hop head and expect this to be a big bitter IPA you won't get it, but is still a good beer and has its place among pale ales and IPA's. I would also suggest this as an intro IPA for people trying to get into the style. Other IPA's worth your time: Bell's Two-Hearted Ale, Stone IPA, Three Floyd's Alpha King, Founder's Centennial IPA, Victory's Hop Devil, and DogFish Head 60 Minute IPA are all available here in Indiana. 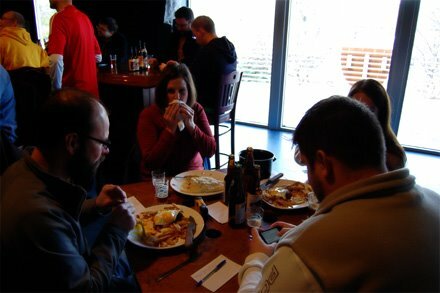 The First Ever Hoosier Beer Geek Breakfast was a blast. Thanks to everyone that came out. Because of what seemed to be a very happy and enthusiastic crowd, we'll be doing this again. Your pictures and notes will be up on the site later this week. Thanks again. It's time to get your Irish on! Bust out the green food coloring. Pull out your "Kiss me I'm Irish" t-shirt. Put on your Notre Dame hat. Eat a bowl of Lucky Charms. And look for the pot o' gold at the end of the rainbow. All over the city, bars are bustin' out the Guinness, Harp, and Smithwick's. Even the historic German beer hall the Rathskellar in downtown Indianapolis is throwing a huge St. Patrick's Day party. While Guinness, Harp, and Smithwick's are traditional, there are other beers out there that would make for a better trio when celebrating on March 17th. 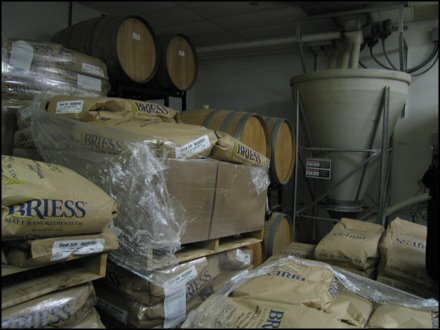 Last year, we convinced Deano's Vino in Indianapolis to put on Barley Island's Black Majic Java Stout, Rogue's Brutal Bitter ESB, and Three Floyd's Brian Boru. That was a stellar St. Patty's line up! Seeing as St. Patrick was born and partially raised in Scotland before venturing to Scotland, I'd mix it up a little: Belhaven Scottish Ale Nitro Cans, Schlafly Extra Irish Stout, and Upland Ard Ri. Wearing of the green is one thing, but drinking it is something else entirely. Ingesting green-tinted swill is tantamount to wearing a badge that reads, "I'm neither Irish nor particularly bright - scoff at me." The accepted colors of Irish beer are black, red and gold, and in our traditionally minimalist fashion, we'll be offering one keg of each (two Gravity Head listed selections and one not) while shunning the other, more egregious and inauthentic forms of Hibernian revelry. Rogue Kells Irish Lager - Tasty, full-bodied lager. Brewed in Oregon. Superior to Harp. Upland "The Ard-Ri" - More craic than Smithwicks, any day of the week, and especially this one day a year. Stone Imperial Russian Stout - Russian and Irish aren't the same thing, but this choice is in homage to the 1980's joint venture between Aeroloft and the Shannon Airport authority, which led to the airport's rise to prominence (and did not prevent the collapse of the Soviet Union). Ted at Brugge suggested drinking Brugge Black, White, and Tripel de Ripple for St. Patty's Day. Someone should explain to him that St. Patrick is the patron saint of Ireland, but Belgium. Personally, I have a six pack of Schlafly Extra Irish Stout waiting for me at home. I'll be enjoying that on Tuesday! But wherever you are and whatever you are drinking, we hope you have a great St. Patty's Day. Here is your weekly Random Beer Roundup - it's magically delicious! Remember, if you have beer news that you want to share, drop us a line at hoosierbeergeek@gmail.com. Beer Geek Breakfast -- Sorry, sold out. Tasting of Irish Beers! Duh! Don't forget about our weekly FREE beer tasting every Thursday 6-8pm at the "Big Store" at 418 North College in Bloomington. A keg of Kentucky Breakfast Stout has been secured. Get Ready! We are hosting a KBS "Kill the Keg" Night. Meet Greg Hall, Head Brewmaster from Goose Island. This will be a ticketed event, but the details aren't fully finished, so stayed tuned for details! Dark Lord Day is six weeks away. More details keep showing up at DarkLordDay.com. 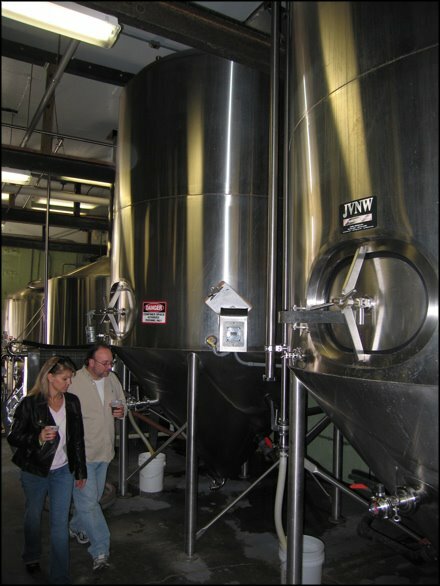 There is lots of stuff about New Albanian Brewing Company's new Bank Street Brewhouse on Roger's blog. Just for the record, we will be having a bit o' Thunderbird from Mad Anthony, O'hara's Irish Red from Carlow brewing, (we just finished their Carlow Stout on tap), although all these are in bottles. Also, something from World Class that I haven't picked yet doncha' know? Speaking of new beers, we just tapped Northwind Imperial Stout from Two Bros. and it won't be lasting long. We pour it through our Nitro Tap just for funsies. Breckenridge 471 Double IPA 22 oz. - Sam Adams Imperial Stout - Our take on the stout brewed by 18th century English brewers for the Russian Imperial Court of Catherine II. The special malted barley in this intense and massive brew delivers rich flavors like dark chocolate, coffee and anise. - Sam Adams Imperial White - Sam Adams Imperial White pushes the boundaries of a witbier. While the brew delivers orange and coriander notes typical of a witbier, it has a bigger mouthfeel and body. It is truly a unique brew. - Great Divide Espresso Oak Aged Yeti Imperial Stout - with what might be the longest name for a beer ever. A generous infusion of Denver’s own Pablo’s espresso adds yet another layer of complexity to this beer, combining with the vanilla oak character, intense roasty maltiness and bold hop profile to create a whole new breed of mythical creature. It’s official, you can now have Yeti with breakfast. - Great Divide Claymore Scotch Ale - Named for a medieval Scottish sword, Claymore Scotch ale is a tribute to the legendary "Wee Heavy" beers of Scotland. A malty, deep-ruby-hued ale, it features a generous amount of caramel sweetness, a reserved hop profile and a subtle warming character, at 7.7% alcohol by volume. - Grado Plato Chocarrubicais - a new Italian offering, this is brewed with cocoa and carab beans, for a great chocolate flavor. - De Proef Flemish Primitive #4 - apparently there are several different versions of this beer, number four holding the moniker of Pin Head. The name is based on paintings by the artist Hieronymus Bosch that adorn the labels. - BBC (Shelbyville Road brewery) Luna de Miel Raspberry Mead - Called the Honeymoon Ale, Luna De Miel is the beverage of love. Brewed in the ancient tradition of fine Meads, this ale owes it's magical qualities to a secret recipe combining the finest barley malt, wildflower honey and red raspberries. Traditionally served at weddings, the custom began in ancient times when it was believed that if the beverage was consumed for one lunar cycle after the wedding, the birth of a son would result. Today, Luna De Miel is the drink of choice for special occasions - or to make any occasion special. - Magic Hat Hi.PA - Hi.P.A. is a medium-bodied groove with a fresh and fruitful nose of tympanic temptation. It begins and ends with a big hop bite that is itself forever balanced on the brink by a steady rhythm of malt. Dry-hopped for extra quenching in the face of heat and beat, it’s an ideal accompaniment to chilling out, turning inward or sailing onward through the music of the night toward the dawn of the mind. It’s the liquid way to say be here now lest you never come this way again. Great Divide Brewing Co. has two new beers hitting the market this week, Espresso Oak Aged Yeti & Claymore Scotch Ale. The Espresso Oak Aged Yeti is the most recent addition to the Yeti line. It's made with Denver's own Pablo's espresso and offers an entirely new dimension to the Yeti. The Claymore Scotch Ale is a tribute to the wee heavy beers of Scotland. This is a big, malty beer with caramel sweetness and subdued hop bitterness. Also new to the Indiana market are Great Divide Brewer's Picks 12pk Mix Packs! All of these beers feature Great Divide's new packaging as well. Keep your eye out for many more special, new releases from Great Divide throughout 2009!! Also, new to the market is J.K. Scrumpy's Organic Farmhouse Cider. This is an organc, sulfite & gluten free farmhouse cider from Flushing, MI. J.K. Scrumpy's Cider is produced the old world way using only two ingredients: Apple Juice & Yeast. 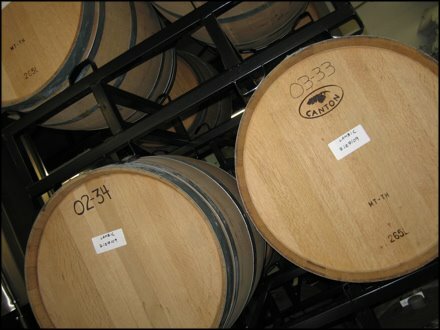 They press their organic apples right after harvest and allow them to ferment for 6 months before bottling. The result is a big, bold farmhouse cider with depth of flavor and complexity that are only achieved using this slow, old world process. This is truly an artisan farmhouse cider from Michigan that due to variations in the seasons and weather is always going to be unique from batch to batch and an adventure each time! Enjoy!! Two Brothers has released a very small amount of Monarch Wit to the market starting this week. This wonderful Wit is brewed only once a year and is best consumed fresh. Two Brothers Monarch Wit is a traditional Wit style beer, crisp and refreshing and spiced with coriander & orange peel. It is a PERFECT beer for the Spring and early Summer! Boulder Beer's Sweaty Betty Wheat Ale is back out and will be a year around beer from now on. Because of the outstanding feedback on this former summer seasonal, Sweaty Betty will now be sweaty and ready all year long!! Stone Old Guardian Barley Wine 2009 is out in the market and tastes absolutely wonderful this year!! Super hoppy, compare it to past vintages and see how this monster matures. Remember, next week is the official relese of Founders KBS (formerly Kentucky Breakfast Stout). The first cases will start hitting the market next Tuesday, so get out to your favorite stores & bars who support Founders and get it while you can!! For those of you who don't know, KBS is an Imperial Stout brewed with massive amounts of coffee and chocolates and then cave-aged in oak bourbon baarrels for an entire year (11.2 % ABV). Good luck on getting some and enjoy! I just thought I would pass along a great deal found on Shiner Bock. Dinner Bell Cash-N-Carry at 2835 Shelby St has cases (24) of Shiner Bock for $12.99. I'm not sure if it's a pricing mistake or not.